Some people were truly upset a couple of years ago when IKEA announced plans to discontinue the Expedit series. Basically a bunch of square shelves stuck together, the Expedit series is pretty much perfect for everything from storing records to displaying your favorite collections, to acting as a room divider. IKEA fans breathed a huge sigh of relief, though, upon realizing the much-loved series was being replaced by the Kallax, which is basically the same thing but uses less wood. We’ve compiled this round-up of fabulous rooms using the Expedit and Kallax shelving units to show you just how versatile this IKEA classic is. 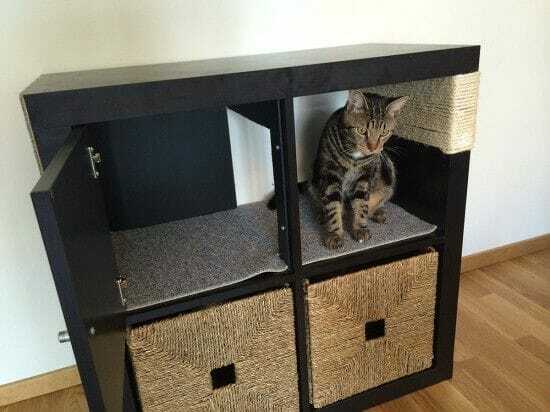 This kitty cat appreciates the efforts of her genius owner who transformed a Kallax shelving unit into a play area and storage space for cat toys. The upper half has a piece of carpet on the base for a soft place for the cat to sit, and durable, scratchable rope is wrapped around the side wall of the unit for the kitty to keep its claws sharp on. A door on one half of the upper part allows the cat a place to hide behind, and storage boxes on the bottom of the unit make a great place to keep cat toys out of the way when not in use. IKEA Hackers has the details on how to make this. Modern kids have updated room dividers with these IKEA bookshelves. 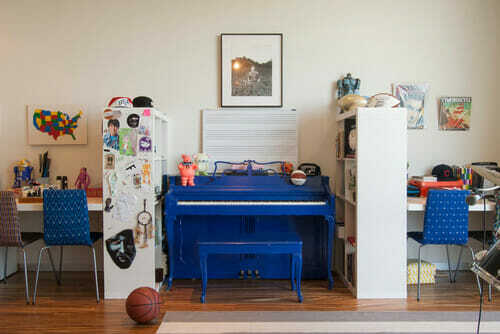 In this kids’ room, parents set a piano for one of their children apart by using a pair of IKEA Expedit bookshelves. On the other side of the shelves are the children’s desks so they can do their homework without distracting each other. In a tiny home with barely 1,000 square feet, space is a premium. This room increased the amount of useable space by incorporating an IKEA shelving unit as a divider between the bedroom and the rest of the apartment. The shelves are used for displaying knickknacks and storing books in a decorative and practical manner. 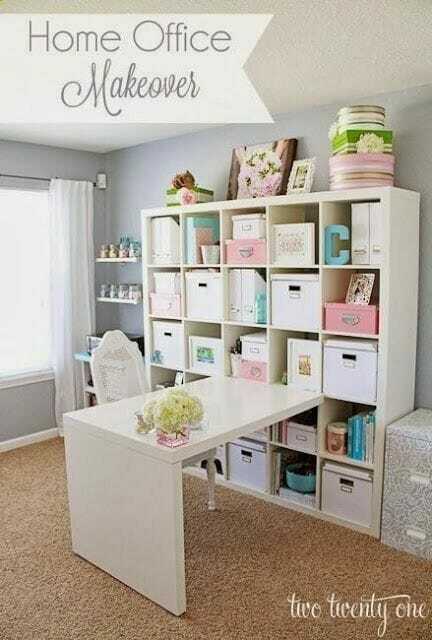 Clutter in a home office comes together neatly in this space with the help of an IKEA shelving unit. The delicate, feminine appearance of this room is enhanced by the sheer curtains over the windows, floral accents, the dainty white chair, and the pink and turquoise storage boxes on the shelves. This sophisticated room uses black IKEA shelves that starkly contrast with the neutral floor and walls. The tailor’s model in the corner adds to the appearance of a chic European flat in a modern, fashion-forward city. This space is actually the corner of a home office, proving that any area of the home can be sleek and stylish while maintaining its functionality. This homeowner knows the usefulness and beauty of IKEA Expedit shelving. This set of low shelves are used near a fireplace to store firewood, candles, and other things to create the perfect romantic evening at home. 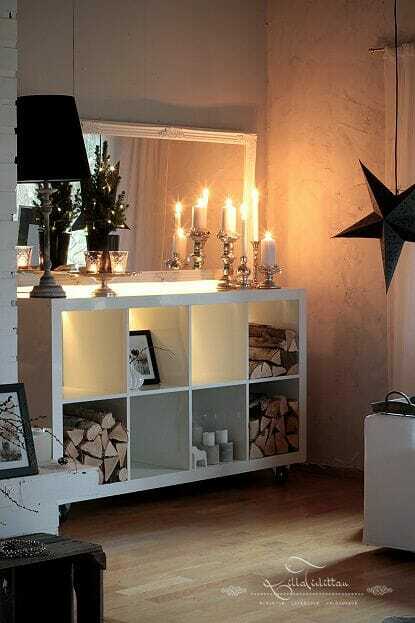 Candles and natural decor help to blend this white shelf into the rest of the room. Turn ordinary collectibles into works of art and a living room into an art gallery by displaying your pieces within the cubbies of an Ikea shelf. In this modern living room, a painting dominates one walls. Beneath the painting, several pieces of glassware are organized and displayed. The simplicity of the shelf does not detract from the beauty of the artwork held inside each shelf.